The Retribution of Scyrah has no greater champion than Vyros of House Nyarr. The leader of the Dawnguard rides to war astride his powerful warhorse Solarys, his hunting hawk circling overhead. 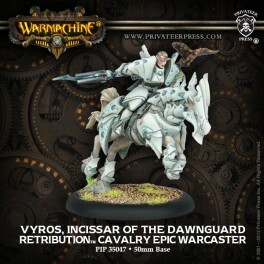 Through her eyes he sees the battlefield unobstructed, allowing Vyros to direct his army rapidly to close gaps in the line or capture critical ground, ensuring he is never outmaneuvered in battle.